Film Suez promoted the Buenos Aires International Independent Film Festival (Buenos Aires Festival Internacional de Cine Independiente) in 2007 with a campaign using the tagline, “If it’s not for you, it’s not for you”. The award winning ad “Clarence” has been followed up with another campaign for 2008, this time featuring a group of four clowns and a group of four Tom Sellecks. A conversation about tofu and cheese takes a strange turn when one of the four participants is asked to show the others his painting. 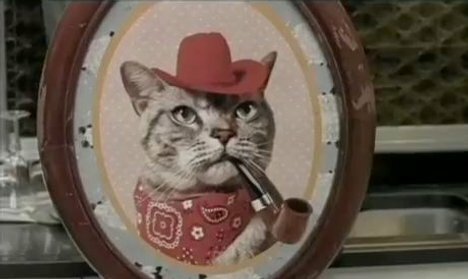 It’s Clarence, a cat smoking a pipe, a sight so sad it brings all but one to tears. Is having a moustache like being a Viking riding on the wings of a tempest? Yes or no? The BAIIFF campaign was developed at la comunidad, Buenos Aires, by creative directors Joaquín Mollá, José Mollá, Ricky Vior, and Leo Prat, creative director/art director Fernando Sosa, art director Ignacio Ferioli, creative director/copywriter Ramiro Raposo, account executive Romina Levi, agency producer Juan Manuel Menvielle. Filming was shot by directors Augusto Gimenez Zapiola and Rafael Lopez via Argentina Cine, Buenos Aires, with director of photography Javier Juliá, producers Valeria Rodero, Florencia Foscaldi, executive producer Sebastian Torrella. Editors were Gustavo Codella and Javier Correa at Cinecolor, Buenos Aires. Sound and music were provided by La casa Post Sound, Buenos Aires and Supercharango. Post production was done at Che Revolution Post. The Clarence ad won a gold at the Cannes International Advertising Festival and also at the Clio Awards 2008.